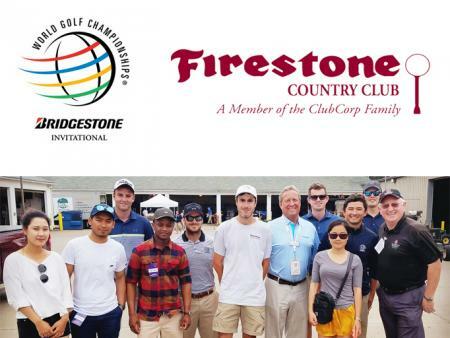 Program manager Mike O'Keeffe and program assistant Thom Nguyen went with seven TOP interns and met with two other TOP-Turf interns, Greg Jones and Sebastian Delgado who are interning at Firestone Country Club in Akron, OH. Mr. Larry Napora, the Director of Operations of Firestone CC, introducded the history of this golf course, and taught interns how the course was prepared. Sebastian and Greg were so excited to meet other TOP interns. The final WGC-Bridgestone Invitational at Firestone Country Club is holding this week, so Mr. Napora invited our crew to step on the course and watch the game. Mr. Napora also introduced how much work they had done to host such a great event. Since tournament preparation can be very different than regular day-to-day operations as the eyes of the world will be watching. This time TOP crew not just assembled by turf-grass interns, horticultural interns from central Ohio were also invited. Included Dahee from Oakland Nursery, Astu and Sandile from Double Eagle Golf Club, Lars Christgau and Bryan from Scioto CC, Joel and Ryan from Muirfield Village Golf Club.